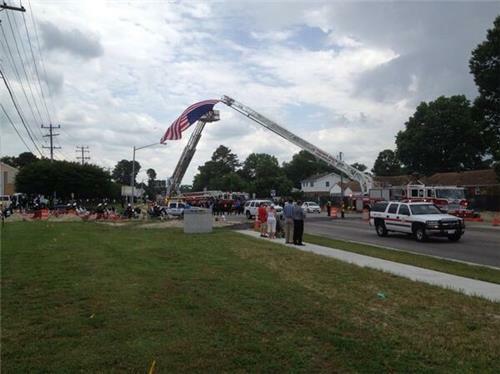 Post your condolences for Norfolk police officer Brian Jones, killed in the line of duty on Friday, May 30th. 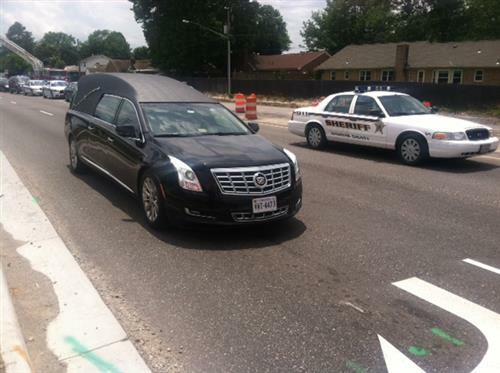 Norfolk Police said goodbye to one of their own today, slain the line of duty. Post your condolences to the family of Officer Brian Jones here. 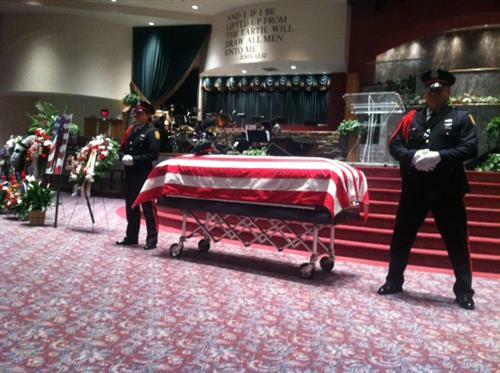 The flag draped coffin of Norfolk Police Officer Brian Jones at Rock Church in Virginia Beach. Police officers from all over Virginia are arriving for this morning's service. My grandfather retired as a Hampton City police officer, my father also served the city as well as the Army in law enforcement. My heart is always heavy for those who loose their life to such senseless violence. My prayer is that his spirit will be left amount those who knew and loved him. Former partner: Brian's house always opened their doors to others. Always provided laughter. Dream was to be an officer. RT @13JoeFlanagan Former partner: Brian's house always opened their doors to others. Always provided laughter. Dream was to be an officer. Rev. Morales reading obituary for Brian Jones. "He is survived by his loving family." Rev. Morales: "I have a lot of respect for Brian Jones... I take my hat off for every officer." Rev. Morales: Brian said I just want to live for God. He was ready to meet his maker. I did not know Brian Jones, but I have a lot of friends that are his brothers in blue and I pray every time they are on the streets. Norfolk has lost a good man and he has touched people even in death. I am sorry for the Jones families loss, please remember the good times and the laughs you had with Brian. To his wife-they say time heals all wounds, but I believe time makes it easier to cope with a lose such as this. I hope every tear and laugh will cancel out every tear you may shed. Lots of love and prayers to you and your family. Commonwealth of Virginia speaking on behalf of the governor. Moran: The loss is shared by officers throughout the commonwealth and nation. We offer our gratitude and condolences. Moran: it is not how Brian died that makes him a hero but how he lived. Mayor Paul Fraim: Pain we feel from Brian's untimely death is hard to understand. 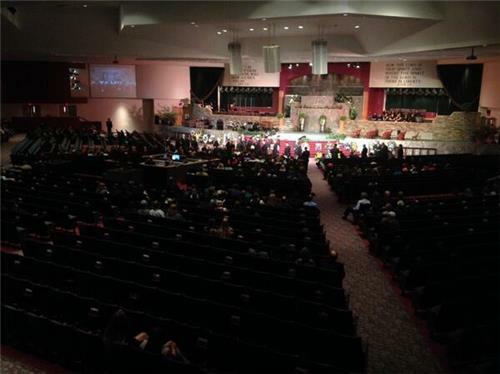 Beautiful service for a hero. 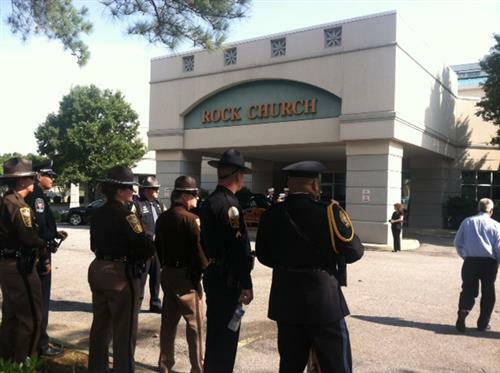 Norfolk Honor Guard doing an amazing job supporting their brother and his family during all of this. Fraim tells Brian's widow our community will take care of them. Chief Goldsmith: Brian was thankful for what he had and compassionate for those in need. Chief Goldsmith quotes another officer "You can rest now Brian we will take it from here." Officer Brian Jones you will be missed. Thank you for service and putting your life on the line. May God wrap his arms around you and take you home and his Angels come down from heaven and wrap their wings around your wife, children, family and friends. Rest in Peace. My heartfelt condolences to the family of Brian Jones. He bravely gave his life protecting others. God bless him and you. I hope his family can find comfort and healing in the love of all who's lives he touched.His light will shine in the Heavens forever. Rev. Jonathan Roberts calls Brian his friend. Tells congregation Brian was a mighty man of honor. Rev. Jonathan Roberts: Says Brian brought out the best in his friends. He made people feel safe and secure. Rev. Jonathan Roberts: He was tough! He was an officer! And he was a man of God! Benediction given by Rev Robert Roadcap. "Let's pray that we will remember." Rev Robert Roadcap: praying for Brian's wife and children. Asks god to be there during the quiet times. Rev Robert Roadcap: lord stand by us and help us during the final moments of the service. Police officers filing out. Rebekah jones and family members are grieving as they say goodbye. Family is taking final moments to comfort one another. GOD bless this family in their time of need. What a beautiful service. Thank you WVEC for the live feed. Thank you WVEC for the live feed. Many of us who grew up with Officer Jones in Livingston County, Kentucky have heavy hearts today! Absolutely amazing service. Brings back memories of when I attended Officer's Decker service. 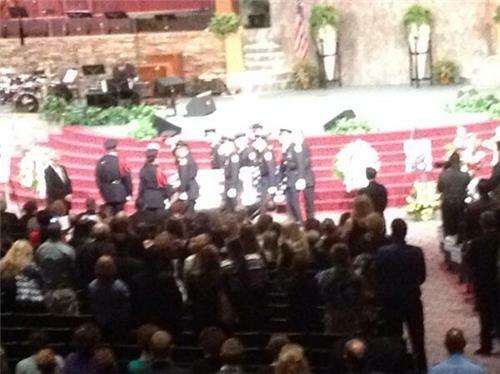 Love how the community comes together for the friends and family - so much love felt. Thank you to the boys in blue for all you do and thank you WVEC for the live stream. May God bless his wife, children, family & friends. RIParadise. Thanks soo much for airing the service! They are great friends of mine. I couldn't make it to Va, to be there in person, But was so thankful to be able to witness it online! We are gonna miss you, Brian. Proud of your courage!